Now that you have experienced the mesmerizing Blue Fire Ijen tour in Banyuwangi, you may want to get another one. Fortunately, there are some other gems of the Banyuwangi tourism objects that you can visit after your tour in Ijen Crater. Exploring Green Bay Beach can be one of the perfect options. 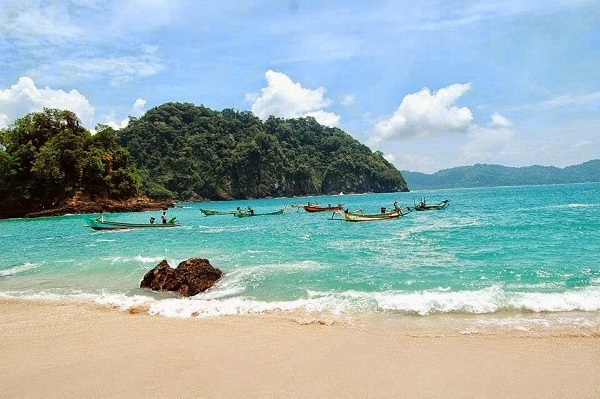 Located in the southern region of Banyuwangi, this beach is for sure one of the hidden gems that is offered for you. So, what is so special about Green Bay Beach that makes you shouldn’t miss this place? This beach is actually included in the area of Meru Betiri National Park and is located between Banyuwangi and Jember Region. And here are some of the highlights that are offered by this beach. For you who are seeking for a hidden beach that makes you feel like it is your private beach, Green Bay Beach is just perfect for you. It is located in a remote area and you need to reach it through the thick jungle and bumpy road. However, the beauty of this beach just makes it worth the journey. The curving white sand of this beach that faces the Indian Ocean waves is surely the highlight to be explored. Along with the clear water, it shows such perfect picture that can get you mesmerize on its beauty. Take a photo or two with such beautiful background will be a nice souvenir to take back home. Since it is not as popular as the other beaches in Banyuwangi which are packed with tourists almost every day, you can expect for more private experience while exploring this beach. You can swim happily with no many people around. Playing with the water and have fun will be more exciting since it is not packed with so many people. The beach is open around 7am to 4.30pm. It is a good idea to come here in the morning or before noon and around 3pm if you cannot reach the beach early. To get there, there are only certain transportations that are allowed to reach the beach, so you need to talk to your tour provider whether it is possible or not to add this beach into your travel itinerary. Exploring the beauty of Green Bay Beach is no doubt one of the best ideas after you visiting the top highlight of Banyuwangi such as Ijen Crater. It may be located in such remote area, but it is worth checking for especially if you are seeking for a hidden beach with less crowds. Now, if you are interested to take a tour to the Banyuwangi tourism highlights like Blue Fire Ijen tour, you can simply go and visit www.jogjabromotour.com to find the right tour package you need. Finally, have fun!